Market Hours: 8:00 a.m. - 4:00 p.m.
GrowNYC's Clothing Collection: 8:00 a.m. - 2:00 p.m.
GrowNYC's Food Scrap Composting:: 8:00 a.m. - 2:00 p.m. This bustling market serves neighborhood residents as well as employees and visitors to Bronx Borough Hall and the Bronx County Courthouse. Located alongside the beautifully renovated Joyce Kilmer Park, shoppers fill their market baskets with fresh, locally grown vegetables, seasonal fruit, local honey and quality baked goods. The Department of Health and Mental Hygiene’s Stellar Farmers’ Markets Program will conduct weekly bilingual nutrition education workshops and cooking demonstrations at this market. 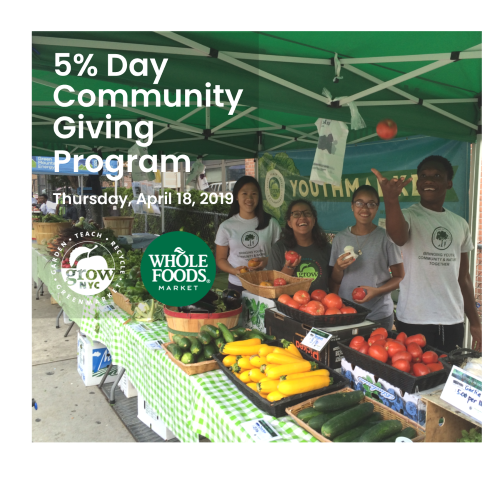 Every participant over 18 years of age will receive a $2 Health Buck coupon for attending the workshop to use towards the purchase of fruits and vegetables.